Day 4 of Restaurant Week - A Deflating and Slow End | The Food Hussy! As soon as Restaurant Week was announced - my friend Scott wanted to go to Jags...so finally we make the reservation to go to Jags. Then the day of - he says - eh - I don't wanna go. I nearly beat him! But we went - and it was a mixed bag of tricks. First course - he had the scallop (3rd photo) - very pretty, tasted good. 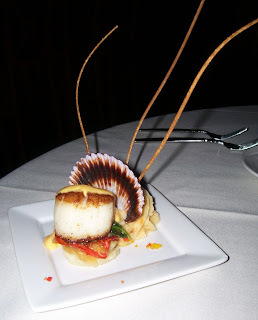 I'm now a scallop snob...they just aren't doing it for me any more. They're always cooked well and interesting but they've lost their wow. 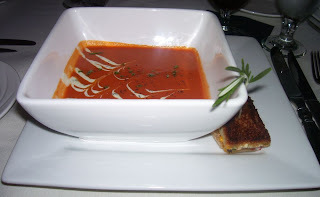 I had the tomato bisque with a mini grilled cheese panini (2nd photo). This was great! The bisque had some bite to it - as in - it was a little spicy and had some pieces in it! The grilled cheese panini was very delish as well! There was spinach, tomato and multiple cheeses! Main course - we were a mixed bag. Scott got the veal ravioli - he wasn't impressed. Jen #1 got the vegetarian substitution and said it was borderline bad (I guess their normal vegetarian selection is very good - this was some sort of vegetable ravioli and wasn't good). Jen #2 and I went for the Chateaubriand (steak) - we weren't impressed. The steak was barely medium rare- more medium to my taste. It was also very dry and very bland. The mashed potatoes were fine - but nothing special, the asparagus - eh - no flavor - no seasoning. Basically - none of us liked our 2nd course. 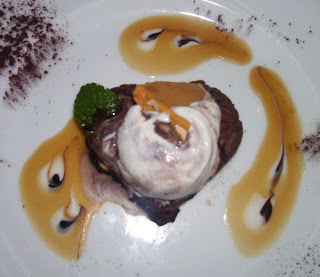 Dessert - 3 of us got the brownie with peanut butter ice cream - PERFECTION (picture #1). The brownie was warm and soft and amazing - exactly how a brownie should be. The peanut butter ice cream was delightful - not too strong but just enough flavor to compliment the brownie. So - 1st course and 3rd course - 3.5 stars. 2nd course and service - 1 star. First, I am so jealous that you got to do so many nights! Now onto Jag's... I didn't like the ravioli either, but the Chateaubriand was a perfect medium rare and our service was excellent. I'm gonna say that's the difference between a hopping Saturday night and 6:30 on a Thursday! Actually my next post is going to be addressed to the Restaurants that participated in Restaurant Week basically speaking to just that. I have the email of someone at GCI and plan on making sure he gets notice of it! I went to Jag's on Wednesday and while service was a little slow, I felt like the live music in the lounge more than made up for it. It gave me and my dinner companion more of a chance to savor our wine between courses... but then, I like REALLY LONG dinners so I probably didn't even notice a slower-than-usual service. Then again, like chick, I went mid-week so they weren't as crowded. Thats the difference between Jeff Ruby waiters and everyone else. We love every guest. That's why these out of town restaurants come in to this market, expect to pull the best help(both front and back of the house) and wow the dining public. They don't succeed because they forget what's important. THE GUEST!!! Well if Jeff Ruby's participated in Restaurant Week - maybe I could afford to go there! I gotta call it like I see it!